Your problem: When I use gel, my hair looks too "styled." ...And there's no shame in Murray's Pomade ($3; murrayspomade.com), a classic can o' wax that will have your mom pinching your cheeks. Always remember to apply a little — a good dime-sized drop — then add more as you need to. Your hair should be damp, before it's taken on a shape. Emulsify in your palm and apply to the roots, working your way out, then use your hands to style, never a brush or a blow-dryer. Rodney Cutler is a former Australian football player, Ironman triathlete, and the owner of the Cutler salon in New York City. Aristocratic emigrés and Park Avenue Princesses have designated Julien Farel's salon their first stop on the social circuit. (Julien Farel quotes:) ...Murray's Superior Hair Dressing Pomade creates "edgy, piecey looks." Strategy: When your hair has lots of natural body, "you have to worry about the pouf factor," says Mark Garrison of the Mark Garrison salon in New York City. Hydrating products can keep you from getting a big head by adding weight. A medium-length cut is the most versatile, says Garrison: "For work you can slick it back, and at night you can muss it up to look more casual." Maintenance: Wash every couple of days with formulas that have a lot of nutrients. "A dense conditioner can really manage puffiness," says Garrison. Polish: Work an oil-based pomade or cream all the way through for control and malleability. Styling Stuff: Murray's Super Light Pomade & Hair Dressing, $3, 3 oz., murrayspomade.com. This less greasy version of the barber's favorite turns down the volume. Slicker Than Grease, by Daniel Yowell. Anyone who has ever set foot in a drugstore has probably seen a can of Murray's pomade. You know, it's that orange tin can displaying a man and woman, both with finely groomed Afros, on its lid. While the Murray's can may appear to be some carefully orchestrated, retro marketing concept, it's really just part of a quality product that has remained virtually unchanged for more than 75 years. When Mr. C.D. Murray founded the company in Chicago in 1925, it was nothing more than a line of products sold through his own barbershop. Murray stood by his products, believing that quality and reasonable prices would prevail over the flashy advertising and marketing of his competitors. When Murray passed away in the mid 1950s, a friend and distributor of his products named Harry Berlin kept the business alive. "It was not the most common relationship, with the racial tension of the time," says Jim Berlin, Harry's grandson and sales and marketing director of Murray's. Nevertheless, this black barber from Chicago and white pharmacist from Detroit developed a strong bond. Harry Berlin helped Mrs. Murray with the business after Mr. Murray's death, driving to Chicago on the weekends for several years. Eventually Mrs. Murray chose to sell the business to Berlin, who moved it to Detroit in 1959. Today Murray's makes not only its original 1925 formula pomade, but a variety of other products as well. Murray's Super Light is a softer alternative to the extra-thick original, and NuNile is a hair slick. Murray's also makes an assortment of conditioners and beeswax. The Berlin brothers - Jim, Jeff and John - now operate the small family company with oversight from their father, Arthur. Their offices are part of a small factory that gets pumped full of petroleum on a regular basis. "A 5,000-gallon tanker plugs right into the back of the building," Jim Berlin explains. The petroleum is mixed and then combined in different ratios with wax and other ingredients to develop the varying holds and scents of each Murray's product. Little has changed over the years in this family-owned company; many of the products and their packaging have stayed the same for decades and they're still dirt-cheap. A can of original Murray's retails for about $2, which is mind-boggling considering that some pomades sell for $10 and up. But what has exploded most recently is all the hype. In his office, Jim Berlin has a shelf loaded with fashion magazines in which high-profile hair stylists sing the praises of Murray's pomade. "There's Vogue, GQ, InStyle, all writing about Murray's," says Berlin, "which is a $2 household product basically made for African Americans that you can get in the drugstore. Yet we get half a page because all of the top white hairdressers use the product. It's a cool product, it works, and it's cheap - it's perfect for what they do. It's so heavy that hairstylists can do a style with it, and then change the style without having to wash the hair because the grease stays in. It's made to stay in the hair." A number of celebs have unofficially endorsed Murray's - George Clooney, Justin Timberlake, Brian Setzer and Leonardo DiCaprio to name a few. Even Detroit icon Joe Louis used to promote Murray's in the '30s. "I get emails from all kinds of bands - hip-hop bands, punks, rockabillys - all those guys use the product," Berlin remarks. Murray's has even begun selling T- shirts in response to consumers' demand for them, and they've become hot items. "There's a guy named Roadkill who buys one of our pomades, eXelento, and he buys a lot of shirts," recalls Berlin. There's even a band in Spain called the NuNiles - named after the Murray's slick. Getting Creative: Alternative uses for Murray's pomade include: lubrication of factory machinery and auto parts; shining show horses' coats; and soothing newly tattooed skin. Troops in Desert Storm even used Murray's to protect their faces from heat and harsh winds. Getting Warm: Murray's was originally packaged in a tin can so that it could be heated on a stove and softened prior to use, but Jim Berlin recommends using a hair dryer or running the can under hot water to soften the pomade. Getting Duped: "We used to have a salon line and, basically, we were selling half a can of Murray's for $10," confesses Jim Berlin. "It was the same product; people bought it. There was a different fragrance, but the physical product was identical." Murray's has since returned to nothing but good, old-fashioned value. Getting Dressed: If wearing Murray's in your hair just isn't enough, here's a less messy way to wear it on your torso: Visit www.murrayspomade.com and get your own Murray's T-shirts. Choose styling aids specifically for your texture... Murray's Pomade, $3. Imparts an allover shine while giving serious hold to coarse hair. Great doesn't always mean pricey, as these pro favorites prove... Murray's Pomade ($3; drugstores). Stylist Richard Martin says he uses just a tiny dab of this wax when straightening Lisa Kudrow's curls. Hairstylist Chris McMillan used... Murray's Hair Dressing pomade (at drugstores). Power Tools: ...Murray's Wax: "Adds definition." More than your nagging little brother or that boomerang you bought when you were 10, hair refuses to heed your commands. It sticks up when you wish it wouldn't; it won't stick up when you wish it would. Which is why, for the past three-quarters of a century, Murray's Superior Products of Detroit has survived as the General Motors of hair grease, rolling out nearly 2 million orange tin cans a year of its classic pomade. Apply it to your wiry, fluffy, curly, whatever hair and your locks fall in line like a freshman cadet. And, unlike George Clooney in O Brother, Where Art Thou?, you won't have to scour the countryside for your pomade of choice — you'll find it in the black-hair-care-product section of your local drugstore for about $2 a can. Murray's hasn't changed its formula since its late founder, Chicago-based barber C.D. Murray, copyrighted the thick-as-wax hair dressing seventy-five years ago. And although African-Americans account for about 80 percent of the company's business, such high-profile white boys as Leo DiCaprio and Brian Setzer — and just about every stylist in the fashion industry — have also reached for Murray's. Whatever your hair type, consider some advice before dipping your fingers into a can: For best results, soften the waxy stuff with a hair dryer or run hot water over it. Or do as they did back in the day and place a can on the stove or the radiator. Any of these steps will make it easer to apply Murray's. As for getting the industrial-strength gunk out of your hair — good luck. 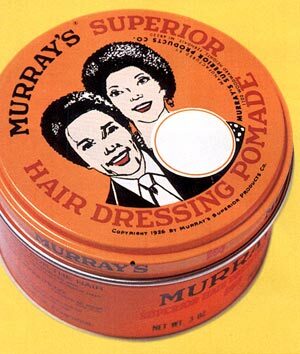 The funky brand used by Justin Timberlake, Coolio and Leonardo DiCaprio is Murray's Pomade, $11.95. It adds texture, shine, lift, and holds hair in place all day. Murray's hair pomades in fun tins add slickness with shine and give varying degrees of hold. They were first on the market in 1926 and are still going strong! Priced at $5.50 - $11.95, from pharmacies. Think gangsters and moonshine when you try one of Mr. C.D. Murray's hair pomades, first on the market in Chicago in 1926 and now available in New Zealand. We love the retro tins — and the price! Try Original, Strong Hold, Super Light, Black Beeswax, or Exelento, all from $5.50 to $11.95. INSTYLE, October 1998, It doesn't take Einstein to figure out that a short piece of hair is lighter than a long piece; thus, more flyaways. Tyra Banks battles wayward hairs with Murray's Pomade. THE NEW YORK TIMES MAGAZINE, Spring 1999, picture, "I've tried everything in my hair from axle grease to Crisco, and I tend to like Murray's the best," says Buster Kretin of Mr. Badwrench, a rockabilly band. FAMILY CIRCLE MAGAZINE, 4/20/99, picture, George Kriakos, hairstylist. Ontario native George Kriakos was a leading hairstylist for top Canadian Fashion Magazines before settling in New York where he is in demand by stars and celebs, George's Finds- Murray's Superior Pomade - This fragrant ointment is perfect for the wet look or to slick hair back. ALLURE, June 2000, picture Super Light, "Avoid hair spray, hard gel, and heavy mousse that weighs down the hair," says hairstylist Kevin Mancuso of New York's Peter Coppola Salon. If you use heavy products Saturday morning, your hair will be begging for a shampoo come Sunday. " Stick to flexible products like Murray's Pomade which disappear in the hair." ALLURE, November 2000, picture, A little free advice from Guido Palau, fashion hairstylist, Don't scrimp on the products. " For the runway I use cheap stuff, which has a lot of alcohol in it. The gels are really strong, and the spray is really gluey, but they dry your hair. Good products are better for you." At home, he likes all Kiehl's products and Murray's hair wax for styling. INSTYLE, September 1998, Matt Dillon Man of Style, "I used to use a lot of Murray's Pomade. It's made in Detroit and its really thick. Nu-Nile is another good one, but recently I've been using their Beeswax on my hair." INSTYLE, September 1997, Julianna Marguiles "mushes in" Murray's Pomade to avoid the "bunch of small curls syndrome". GQ, July 1991, picture, style with Murray's. MADEMOISELLE, August 1995, The secret to giving coarse, curly hair shine and control: On wet hair, apply a light pomade to the front, Murray's Hair Dressing Pomade is a good choice, and comb it back. ALLURE, September 1991, picture, Murray's Wax it's wonderful for keeping body and adding shine. ALLURE, August 1995, picture, Slick Trick: Old reliable Murray's Pomade. INSTYLE, October 1996, picture, Murray's Hair Dressing Pomade is a hair smoothing pomade that bicoastal hair guru Sally Herschberger uses on Meg Ryan's mane; John Setaro a hairstylist in LA reaches for it when he wants to control actress Lynn Whitfield's flyaway baby hairs. ALLURE, July 1995, picture, Orlando Pita recommends Murray's Hair Pomade.